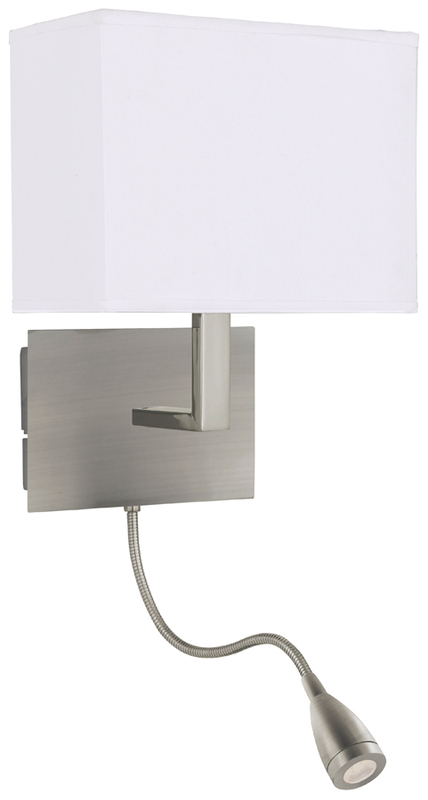 Rectangular shaped satin silver wall mount with an L shaped arm that holds the slim white fabric lampshade. A long, flexible led lamp fitted with a 1 watt LED that is ideal for night time reading. A smart and substantial size wall light that is perfect for mounting either side of a bed. This wall lamp is double switched so you can have either or both lights on at the same time. The fabric shade will also accept a low energy 11 watt lamp. A classy bedside wall light with long adjustable LED reading lamp that gives 140 lumens..